Are You Ready to Learn How to Simplify Fractions? Learning how to simplify fractions is an important concept in math." When working with fractions, most directions will require that you submit your answer in lowest terms. 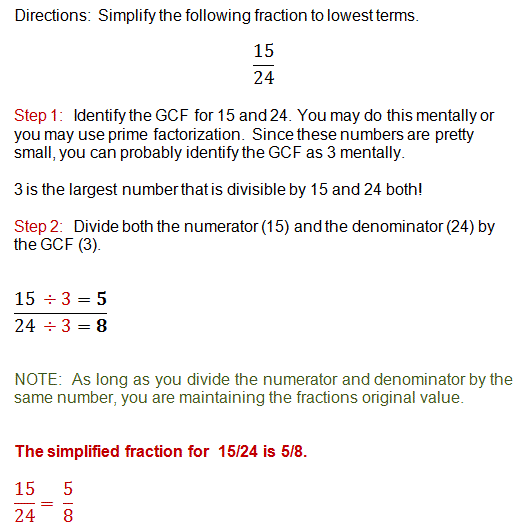 This means that you must simplify your fraction to the point where 1 is GCF for both the numerator and the denominator. Note: this term also used to be expressed as "reducing" fractions. So, if you are asked to reduce fractions, it means to simplify fractions, which is what we will focus on in this lesson. In order to fully understand this lesson, you will need to understand greatest common factor (gcf) and possibly prime factorization (or factor trees). As you can see, you can simplify your fractions in more than one step in order to arrive at the lowest term or you can use prime factorization to find the GCF and simplify in one step. Either way will get you to your final answer! Going back to equivalent fractions, you can determine if two or more fractions are equivalent by simplifying all to lowest terms. If two fractions or more fractions are equivalent, then they will all be simplified to the same fraction. Let's take a look at this last example. Example 3 - Are these two fractions equivalent? As you can see, it's pretty easy to simplify fractions. Identify the GCF and divide both the numerator and denominator by the GCF. This will state your answer in simplest form. You are now ready to move onto the next fractions lesson which is finding the least common multiple.